What if a told you there was a specific type of iron you could use to get more fairways hit and make more pars? Driving irons are basically long-irons that are designed to be more forgiving and useful than the blades of the past, while taking advantage of the more penetrating ball flight and workability that irons can provide. On top of this, driving irons are often considered more accurate and better wind performers than hybrids and fairway woods. This article will explore the strengths of each and help you make an informed decision that will result in more fairways hit and more pars made. 4.1 Should I use a driving iron or a hybrid? 4.2 How do I hit a stinger? 4.3 What qualities should I look for in a driving iron? Driving irons are basically long-irons that are designed to be more forgiving and useful than the blades of the past, but take advantage of the more penetrating ball flight and workability that irons can provide. Why have we picked this driving iron as our editor’s pick? The theory behind the GAPR line is that there’s too big of a distance jump from a 3-wood to a 4-iron, so a GAPR can serve as both a driving iron and a club that helps bridge that distance gap. The TaylorMade GAPR series of clubs is designed to have an iron profile with a few of the added benefits of a hybrid. It comes in a LO a HIGH versions (which I felt were too much of a hybrid to even consider calling a driving iron) in addition to this model, the GAPR MID. 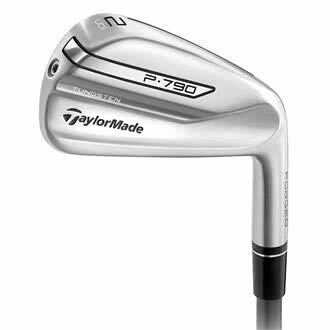 As we also see in the TaylorMade P790 UDI, TaylorMade uses their proprietary Speedfoam technology to fill in the hollow head design. It’s deployed to great effect here, providing an active and lively club face that the ball just jumps off of. 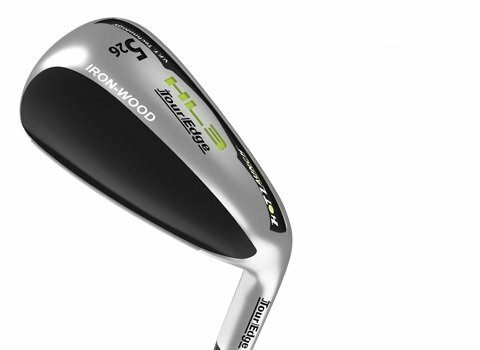 The GAPR feels buttery smooth and has one of the best sounds of any iron I’ve hit this year. The GAPR iron is a little odd-looking, but even though I’m generally a fan of a more traditional look, I found myself liking it a lot more than I expected to. It has the look of an iron face with a thin topline that then has a chunk of metal backpacking behind that traditional iron face. Perhaps it’s the great color combo of a matte charcoal face and Darth Vader-black chrome elsewhere that makes the odd look effective and confidence-inspiring. You may have noticed that there’s an identical entry in the Pros and Cons section above: the GAPR produces a very straight ball flight. This is a pro in that as long as you make a good swing and square the clubface to the target, the ball is going straight down the fairway. It’s not going to impart any sidespin, and it’s very difficult to hook, slice, fade or draw the ball. However, a lot of players in the market for a driving iron want to curve the ball, so an overly straight flight like this winds up being a con more than a pro. Slower-swinging players and higher handicappers will probably love the GAPR MID, however. And if your specialty is Francesco Molinari-esque laser straight bullets, then the GAPR MID is likely a great option for you. Why have we picked this driving iron as our best for purists? The TaylorMade P790 UDI Driving Iron is one of my favorite clubs tested this year. It’s a traditional-looking club with great workability and elite distance that really rewards good swings. However, there’s not much forgiveness if you miss the sweet spot. Thin and toe hits suffer significant losses of distance, so I’d recommend this only for single-digit handicappers with swing speeds of 100+ mph. The elusive stinger is a beautiful thing: a low, penetrating shot that cheats the wind but still flies a good distance, hits the ground running and rolls out to a position that rivals other players’ drivers or 3-woods. The TaylorMade UDI Driving Iron seems like it was designed with this in mind. Its 17-degree loft is that of a traditional 1-iron, which means you’ll need a pretty high swing speed to get it into the air at all. But put a good swing on it and it really goes! The steep loft and minimal offset will delight low handicappers and terrify beginners. The classic design without much perimeter weighting makes it rather workable. I found it a little easier to hit draws than fades, which could be a result of the tungsten weight in the toe imparting extra draw spin to the ball. But compared to most clubs I tested, it was much easier to shape shots to fight the wind and optimize the angle for the next shot. TaylorMade is always on the cutting edge of golf technology, and their patented Speedfoam is no exception. The thin face is backed up by this unique filling, giving a springiness you won’t find in a solid forged iron. They also tout an “inverted cone” in the face to further sweeten the sweet spot. And I can tell you, it’s one fantastic sweet spot: it feels like hitting a golf ball with a trampoline. On windy days, I was able to hit low balls that hovered under the breeze and rolled out, even into a strong headwind. Hitting it off the fairway was tough but doable and was very useful on holes with room to run it up to the green. You’re not going to find yourself hitting high shots that land and stop, but that’s not why you carry a driving iron. 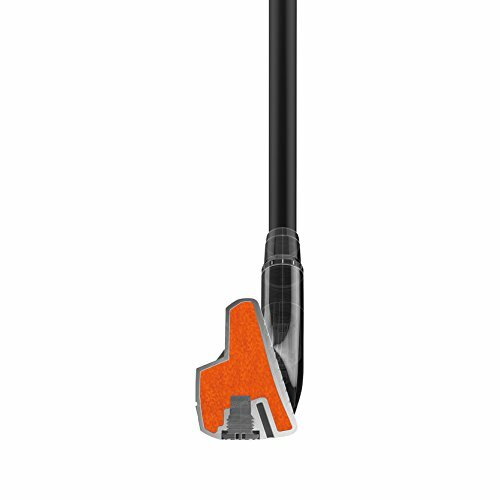 The TaylorMade UDI is built for penetrating trajectories and workability, and it does both very well. Make no mistake, these are irons for elite golfers – players who are shooting par with regularity and contending for club championships year in and year out. Srixon is a company known more for its golf balls than anything else, but in recent years their blades have been renowned as some of the prettiest and best-made irons out there. This is one of them. The Srixon Z Utility 65 is one of the best-looking traditionally-styled driving irons I’ve come across. It hearkens back to the Hogan Apex irons of my youth, only with updated features and even prettier construction. The sole is thicker and, surprise surprise, there’s a hollow section of the head to lower the center of gravity and make the club a little bit easier to hit. However, this is a far cry from the other hollow headed clubs offered this year, as it still plays and feels like a classic blade. The best thing about blades is how workable they are. If you’ve got the talent, then blades will let you impart sidespin that can result in trap draws, high fades, baby cuts, and more. While that may sound daunting to most players, it’s the holy grail that golfers dream of: hitting the right shaped shot to get to that tucked pin and make birdie where other players dream of par. The Srixon Z Utility 65 is the most workable iron I tested this year, with purely struck shots resulting in the picture I had in my head prior to the swing. The drawback to this is that shots that aren’t struck purely are much worse than they’d be with a more forgiving driving iron. 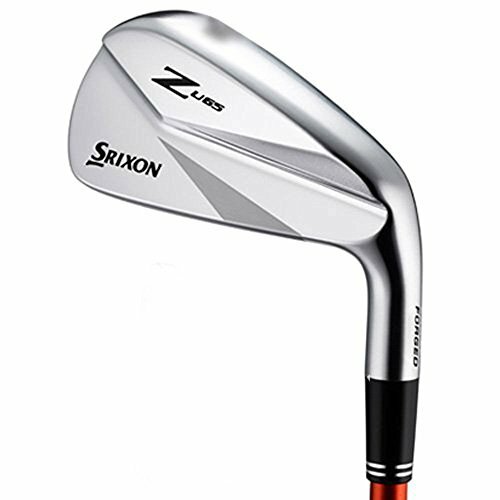 The Srixon Z Utility 65 was the most reliable producer of the low, wind-cheating stinger that I look for in the best driving irons. If you’re a better player looking to expand your repertoire to include a stinger, or just looking for a club that you can consistently shape shots with that won’t get you in as much trouble as a wild driver, the Z Utility 65 should be on your short list. 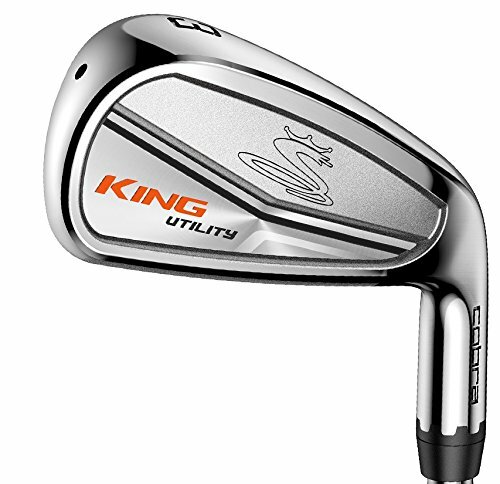 The Cobra King Utility Iron is more than just a driving iron, which makes it an attractive option but slightly reduces its effectiveness off the tee. I found that some of its other strengths might make up for the slight reduction of performance off the tee. Even the 2/3 utility iron was remarkably easy to hit from the fairway, but the trajectory when I teed it up (even teed very low to the ground) was higher than I’d like from a true driving iron. Cobra is one of the pioneers of adjustable clubs, giving players the option of several different lofts to fine-tune the trajectory to their liking. They haven’t slacked off here, offering the MyFly adjustable hosel that’s also offered in their woods. This lets you adjust the loft of the club while keeping the face square to the target line, quite an engineering triumph unto itself. I found myself tuning the loft to the lowest possible to get that desirable penetrating ball flight, but slower swing players will appreciate the ability to add loft to help get the ball airborne. I’m beginning to see a pattern here of technologically forward-thinking golf manufacturers making driving irons with hollow bodies to increase hittability. This does help driving irons become more accessible to more players, but it sacrifices a little bit of the strength of true driving irons. I found the trajectory nice but a little too high for my tastes. When I tried to hit wind cheaters, I really had to move the ball back in my stance and use an exaggerated knock-down swing to accomplish the trajectory I wanted. However, the tradeoff is that I found myself hitting the utility iron out of tougher lies in the rough than long irons of old, and it was still useful in hitting low bullets out of the trees when I had to keep it under limbs. So while the hallowed stinger wasn’t quite as hot as I’d like, the overall usefulness of the club was quite high. The tungsten toe weight is another feature that’s beginning to become standard in driving irons these days. It helps counteract the weight of the hosel and distribute the center of gravity more across the whole face, and it works here. The sweet spot is large and lively. Tour Edge is fast making a name for themselves as a hidden gem in the golf club market, and the HL3 Hot Launch irons are a big reason why. While they’re offered as a complete set of “iron-woods”, the 18°, 20° and 23° are all considered driving irons. This provides several nice options for players depending on what they’re looking for: if you want a higher launch or just a club to replace your 3-iron that’s not quite a hybrid, the 23° is a good option. For a lower ball flight and more of a traditional driving iron, the others should fit the bill. The most attractive feature of the Hot Launch HL3 driving irons is the fact that it has a forged face. Forged irons, even if it’s just the face, provide a vastly superior feel to cast irons. To me, they feel somehow smoother and springier, so the ball really leaps off the club face. The face is very thin overall and has to be extremely close to the maximum limit of thinness allowed by the USGA. It features “variable face thickness,” which means it’s a bit bulkier at the heel and toe to help correct mis-hits and enlarge the sweet spot. I’m a fan of how the Hot Launch HL3 driving iron sits behind the ball, as the color scheme makes it look like it has a thin topline with a blacked-out body. That hollow body is part of why this club is so hittable: the center of gravity is just below the traditional hitting area, so it’s very easy to get the ball in the air. I’m guessing that’s why they call this an “iron-wood” instead of simply a driving iron – you can hit it off the fairway and even out of a decent lie in the rough. However, that does make it a little harder to flight the ball down. When I first looked at and swung the club, I thought it would surely behave like a hybrid: high flight and soft landing. That’s not what most players look for in a driving iron. But I was surprised by the lively face and the lower-than-expected ceiling of the trajectories I was able to produce. None of the shots ballooned and it was playable in the wind. However, the center of gravity is just a touch too low to really get that desirable stinger that gives you an extra 50 yards of roll in dry conditions. Fourteen golf is a relatively new, boutique clubmaker who first made a splash on the scene in 2002 when Ernie Els won The Open Championship with a Fourteen driving iron in his bag. After years of designing clubs for other major manufacturers like Yamaha, Fourteen Golf was finally on the worldwide stage and has been slowly but surely increasing their brand recognition with impeccably clean designs and expertly made irons and wedges. 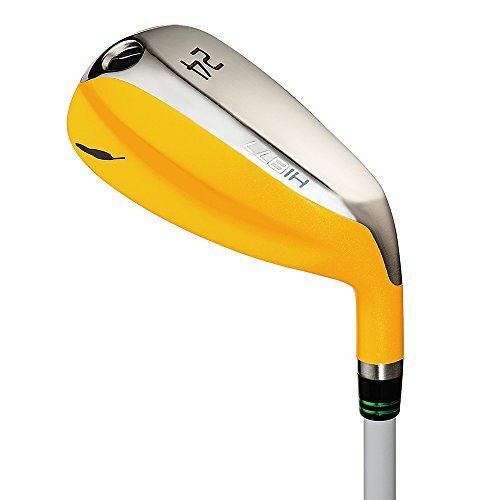 The HI 877 is listed as a hybrid, but I think there may be something lost in translation (Fourteen is a Japanese company), because it looks and plays much more like a driving iron than a hybrid. The clubface looks like an iron, and there’s a slight bulge behind the club head that’s really too small to fall into the hybrid category. Like so many other driving irons, the Fourteen HI 877 features a hollow head construction to maximize forgiveness. This is a driving iron aimed more at the average golfer, as it’s quite forgiving. But it still has a great low, penetrating trajectory and can produce a surprisingly good version of a stinger. You definitely can’t miss the Fourteen HI 877 in someone’s golf bag, because it’s got a very unique color scheme. It’s the first thing you’ll notice about it, and it may be enough to turn off some golfers completely. Fourteen touts it as a “vibrant yellow body”, but I couldn’t ever get used to the slightly mustardy yellow of the club. 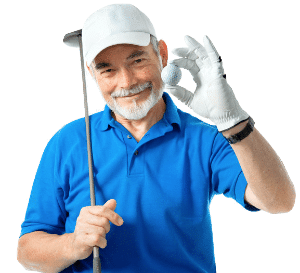 However, just like some players prefer a yellow golf ball, I’m sure there are players out there who would find the yellow of the clubhead quite appealing, or at the very least, not distracting. 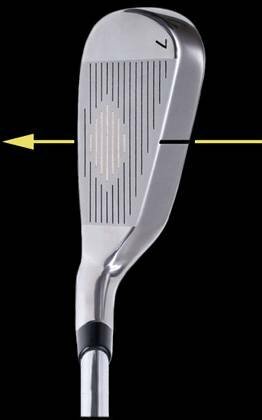 Perhaps the best aspect of the clever design is the sole, which is thick right under the hitting area and thinned out towards the heel and toe. This shape really helps dig through tough lies and makes the HI 877 useful as more than just a driving iron. It’s an effective tool from deep rough, hardpan, pine needles and tight lies. 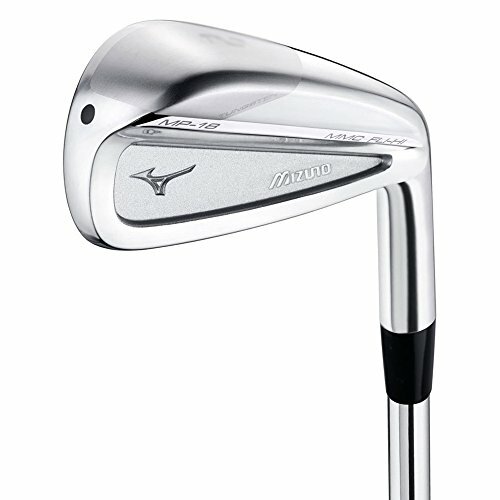 Mizuno’s Fli Hi line of irons is a well-known one amongst driving iron enthusiasts, as it’s been a consistent fixture of their iron offerings for quite some time now. Mizuno’s emphasis has always been on a low center of gravity to help the player get the ball up off the ground. This year’s model is a consistent performing iron that produces a steady, medium trajectory. That sounds pretty good to most golfers, and I’m sure there are many players out there who will love this club. The remarkable consistency of the MP18 MMC Fli Hi driving iron is both a strength and a drawback. It’s forgiving to bad swings and produces trustable results on mediocre swings. Great contact doesn’t result in anything exceptional, but it’s quite functional. This is due to the extremely low and deep center of gravity that you’d expect when looking at the design of the iron: there’s a huge, deep sole and a very thin topline. All the weight of the head is focused as close to the ground as possible – hence the Fli Hi part of the name. My favorite part of the MP-18 MMC Fli Hi iron is how workable it is. Despite the hollow body and tungsten toe weight, I still found it produced draws and fades with ease. This helped make up for some of the issues I had with trajectory, as I could hit a draw into the wind or a fade with the wind and get some good distance out of both. But as workable as the iron is, I still couldn’t find stinger nirvana; the only way to get a low enough trajectory was by swinging easy, and the face simply isn’t lively enough to reward an easy swing with a hot, running stinger. This might be an ideal first driving iron for a player who’s been working on their game and is starting to figure things out and shoot scores in the 70s. Scratch players who know how to hit the low runner will find the MP-18 MMC Fli Hi a bit frustrating, but players who love their hybrids and are nervous about making the transition to driving irons will likely find this to be a nice compromise between the two. Thomas Golf isn’t a very well-known manufacturer, but they’ve got a pretty good iron design on their hands here. It reminds me of the original Callaway Big Bertha irons of the 1990s, which was one of the first oversized irons and featured a similar, very thick topline. This topline is a love-it-or-hate-it feature: higher handicappers and beginners will likely appreciate the feature, whereas better players might be turned off by it. Usually a thick topline like this indicates a straight, high ball flight and that holds true here. As a result, it winds up behaving a little more like a hybrid than a driving iron. The primary feature of the driving iron is right there in the name: the Hollow Head. The hollow head design spreads the weight out to the extreme perimeter of the clubface, which is intended to increase the size of the sweet spot and help correct mis-hit shots. With extremely perimeter weighted clubs comes one major drawback for better players: you lose workability. Most driving iron shoppers are looking for a club they can draw or fade with ease, and this club just doesn’t impart enough sidespin on the ball to make this happen. The shaft of the Thomas Golf Hollow Head driving iron is shorter than a traditional 3-iron, which makes it easier to hit than most. However, you’ll sacrifice distance to this shorter shaft as it’s harder to generate clubhead speed with a short shaft. And the center of gravity of the clubhead is situated very low, which gives the club a high launch. This is often touted as a good thing, but in a driving iron it’s not what most players are looking for. I found it very difficult to hit even a medium trajectory ball flight — every shot went high, no matter how much I tried to knock it down. This is a rare bird: a driving iron geared towards higher-handicappers and slower swing speeds. Most of the other irons on this list will focus their appeal on high-swing speed, better players. This one, however, is for players who want to hit a high, straight shot without much curve. It’s great for that and should help you find more fairways. However, if you tend to play links-style courses or in a lot of windy conditions, you’ll likely want to look elsewhere. The Ping G400 Crossover iron is another entry that touts itself as something between a hybrid and a driving iron, and it performs admirably as such. At address it looks more like an iron but the oft-seen hollow head and tungsten toe weight provide forgiveness and performance like we see from hybrids. However, aside from a bit of a high launch angle that will need controlling on windy days, it’s one of the best all-around entries I tested this year. 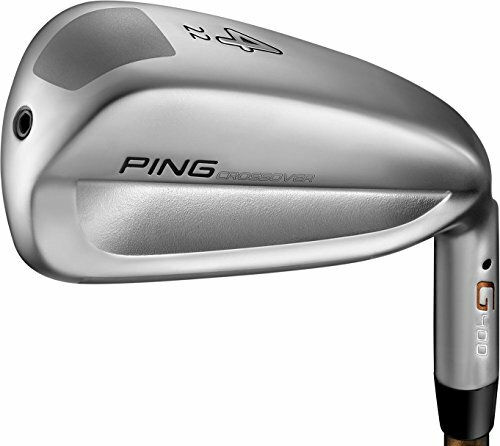 The real star in the Ping G400 to me is the sole design, which is thinner than a lot of the other driving irons tested. I found this kept the center of gravity nicely distributed low and forward towards the clubface so I could produce a reasonably low trajectory. It also was thin enough to use from the fairway and even picked the ball nicely out of some decent lies in the rough. However, when I teed the ball up just off the ground, the launch angle was higher than I’d want it on a windy day. The solution to this was simple enough — just hit it off the ground when the wind is blowing. But I still prefer to be able to tee the ball off the ground, even just a little bit, to ensure a cleaner contact and reduce the chances of a thinned shot. The thin sole also contributes to the G400 being one of the best-looking clubs of the year. It’s got an attractive, narrow topline and just a little bit of heft sitting behind the ball to inspire confidence. The G400 Crossover comes with a counterbalanced graphite shaft that is intended to help with forgiveness, and I found it to be quite effective in doing so. The whole clubface felt like a sweet spot, and distance was acceptable on toe hits, thin shots and heel strikes. A good driving iron needs to have a hot face that really sends the ball off the tee and gives you a chance to make par even when you’re not hitting driver. The ball should launch low, fly far, and roll out nicely. They’re best used in windy, firm conditions when you need a penetrating trajectory to obtain good distance. What separates a driving iron from a traditional long iron is that they should be much easier to hit than a normal long iron. The sweet spot needs to be large and mis-hits should still result in decent shots. While a 3-iron might look intimidating to the average golfer, a driving iron should inspire confidence and be a reliable source of fairways hit. I’m condensing this feeling into a criteria I call hittability. A driving iron should give you the option to hit a stinger: a low, hard shot that runs out significantly after landing. Tiger Woods is famous for it, but one of my all-time favorite stingers is Ollie Schneiderjans’ 341-yard 1-iron from the 2017 Wyndham Championship. The shot tracer shows that its trajectory peaks at a mere 39 feet, but it still traveled 341 yards! If the center of gravity of a driving iron is too low, a stinger will be hard to hit as it’ll launch the ball too high. To me, a good driving iron will let you smash it low and long. One of the main reasons that long irons have fallen out of favor with most amateurs and even a lot of professionals is that they simply look intimidating and hard to hit. Woods have less loft, but the increased body size gives you the impression that the club will help you get the ball off the ground. Long irons with thin toplines look like they’re just sitting there, poised to blade the ball off into the woods and send shockwaves of vibration into your hands. If it’s cold out, they’re even more intimidating. A good driving iron should overcome this: instead of being intimidating, it should paint a picture of tight dispersion, of a ball sailing straight and true down the fairway. When you choose to hit a driving iron off the tee, you’re choosing to sacrifice distance for accuracy. A well-struck driver or 3-wood will always go farther than a driving iron, and the larger heads of the woods allow manufacturers to maximize the sweet spot to help forgive mis-hits. This is tougher to accomplish with a driving iron, as there’s less surface area with which to manipulate weight and center of gravity. But the distance potential of a driver means that if you don’t get it online, it can go deep into the woods. So you take a driving iron, trying to ensure that your next shot will be from the fairway. But you still want forgiveness, as not every swing will find the sweet spot. Forgiveness really matters in this case, since you’re already sacrificing some distance. The last thing you want is to hit it slightly out on the toe and suddenly not be able to reach the green with your next shot. Should I use a driving iron or a hybrid? Driving irons have traditionally been geared towards better players, as they require a high clubhead speed and good contact to even get the ball in the air in the first place. Many slow-swinging amateurs have found it hard to hit anything but worm-burners with traditional driving irons. However, recent technological advancements like hollow heads and tungsten toe weights have brought the driving iron into the consciousness of mid-handicap amateurs who have trouble hitting woods and hybrids. Driving irons are often seen as more accurate and better wind performers than hybrids and fairway woods. If you’re a decent player looking to find more fairways, a driving iron is certainly worth looking into. For beginners, I’d recommend sticking to hybrids and fairway woods. How do I hit a stinger? Before you try to hit a stinger, you should be able to consistently hit the sweet spot with your irons. It’s not a shot that the average player should attempt, as it’s difficult to pull off and has very little room for error. However, if you’re good at making consistent contact, it’s an effective weapon to have. You’ll want to move the ball back in your stance, take a 3/4 backswing, and focus on rotating your hips hard at the target while holding your hands off and releasing the clubhead as late as possible. This keeps the clubface de-lofted but avoids the snap-hook that so many attempts at stingers fall victim to. Make sure you get good at them on the range before you take it to the course, as a slight miscue can easily result in either a snap-hook or a dreaded shank. What qualities should I look for in a driving iron? 1: You should feel confident standing over it. The main reason to use a driving iron is to improve your chances of hitting the fairway. You should feel like you’re primed to fire the ball straight down the middle when you pull out the driving iron. 2: Forgiveness. You’re already sacrificing distance by hitting iron instead of driver, so you want a driving iron that will still deliver a useful result even if you don’t catch it dead solid pure. 3: Workability. The ideal driving iron should let you hit a hard draw or a baby fade, and should allow you to flight it down and hit a stinger.